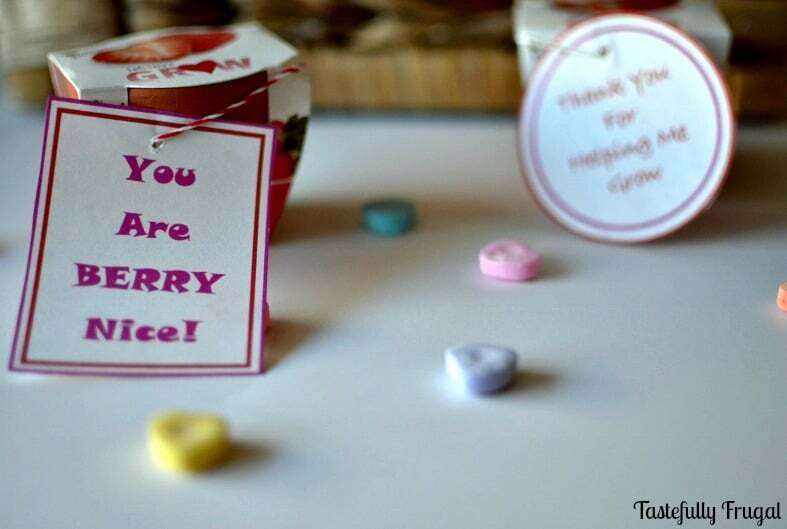 Show the teachers in your life how much you appreciate them with this “berry” nice gift. Happy Monday! I hope you had a fantastic weekend. Only a few more days until Valentine’s Day; are you ready?! I’m pretty much all set aside from the little bit of baking I have get to do. Searching Pinterest, and even Tastefully Frugal, you’ll find several fun valentine ideas for boys, girls, teenagers, girlfriends, spouses, co-workers; but the one person who we can never have enough gift ideas for are our teachers. We wouldn’t be who we are today without the teachers in our lives. So why shouldn’t we be sharing the love with them also?! When I was at Target picking up a few things (and by a few things I mean perusing the aisles looking at anything and everything) I saw these cute strawberry grow kits. I didn’t know what I would do with them but I picked up a few, ya know since they were only $1. 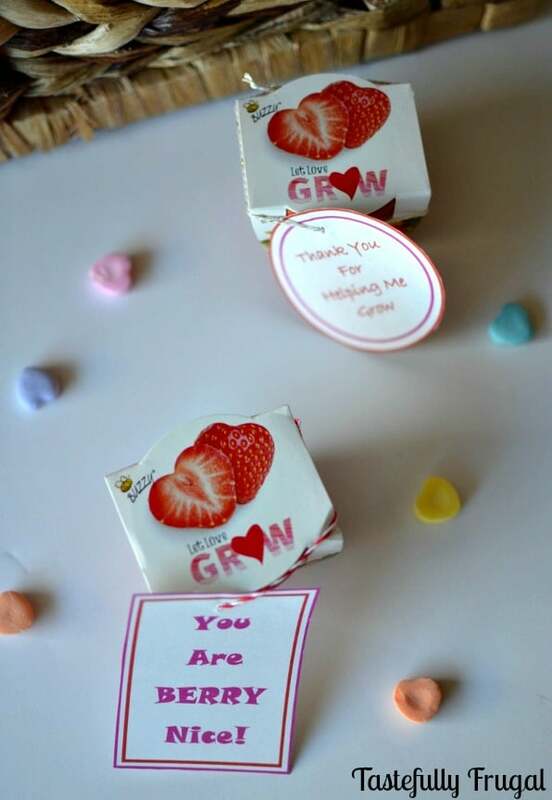 When I was thinking about the people in our lives that I could make valentines for teachers came up and I knew these would be perfect for them! I read reviews online after I got home on whether or not they would grow (because who wants to get a gift that doesn’t work?!) and every one I read said that the plants started to sprout within a few days…score! Head on over to Target, pick up a few and hand them out to your kids’ teachers, coaches, scout leaders, or anyone who deserves a “berry” nice surprise. Printable tags- click here to download. These would make great end of the year gifts too. And if you need more gift ideas check out my Pinterest board! Follow Tastefully Frugal’s board Gift Ideas on Pinterest. Do you have all of your valentines made and ready to go? This is such a great idea. Teachers are often under appreciated. 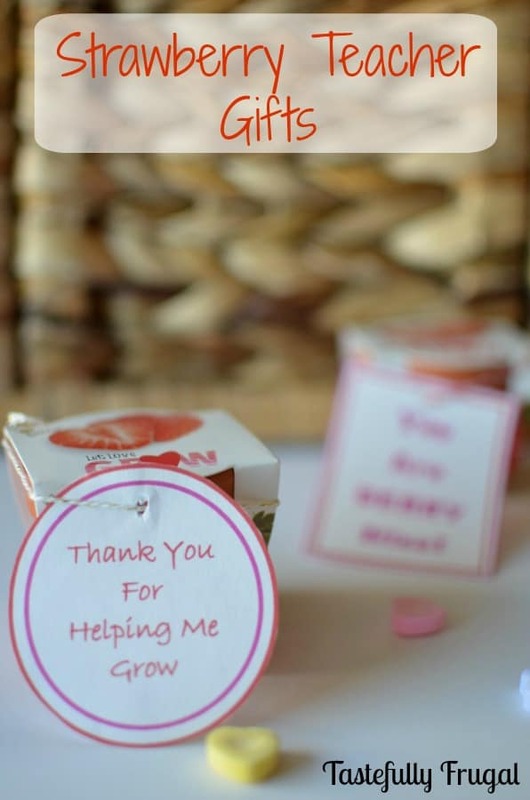 A small thank you from time can really make a huge difference. That’s exactly what I was thinking too! Too cute!! This is a brilliant (and adorable) idea! !